Dissertation title: Electrical properties of hydrothermally altered rocks: observations and interpretations based on laboratory, field and borehole studies at Krafla volcano, Iceland. Advisor: Dr. Freysteinn Sigmundsson, Research Scientist at the Institute of Earth Sciences, University of Iceland. This is a joint degree with Ecole Normale Superieure (ENS), France. The defense has already been delivered. The electrical signature of volcanoes is affected by several characteristics of rocks: volume and salinity of pore fluid, abundance of conductive minerals, rock temperature and presence of molten crust (magma). Electromagnetic soundings are widely used to image the underground structure of volcanoes and look for high-temperature geothermal resources. However, the relative contribution of the above mentioned elements to the measured resistivity is often an unsolved question when interpreting resistivity inversions. This thesis aims at improving the interpretation of electrical resistivity structures at active volcanoes, in order to develop innovative tools for the assessment of high-enthalpy geothermal resources. Focus is on conductive minerals, which can either be solid ionic conductors (clay minerals, in particular smectite) or electronic semi-conductors (pyrite and ironoxides). Also investigated are the effects of porosity, salinity, temperature and melting. Iron-oxides are mostly formed during the primary crystallization of magma, while smectite and pyrite are formed upon hydrothermal alteration of volcanic rocks, thereby witnessing hydrothermal convections. Krafla volcano, Iceland, is used as a laboratory area, where extensive literature, borehole data, core samples, surface soundings and infrastructures are available. The contribution of smectite to the electrical conductivity of volcanic samples saturated with pore water at different salinity is first investigated in the laboratory (room temperature) by electrical impedance spectroscopy, also called complex resistivity. Non-linear variations of the conductivity at 1 kHz with salinity are observed and interfoliar conduction is suggested as an important mechanism by which smectite conducts electrical current. The influence of pyrite and iron-oxides on the charge storage (capacitive) properties of the rock is then analyzed, using the frequency-dependent phase-angle of the impedance. Maximum phase-angle (MPA) higher than 20 mrad can be attributed to pyrite if the rock is conductive and to iron-oxides if the rock is resistive. Moreover, the MPA increases by about 22 mrad for each additional volumetric per cent of pyrite or iron-oxide. These laboratory frequency-domain findings are partly upscaled to interpret field time-domain complex resistivity tomography at Krafla: smectite, pyrite and iron oxides can be identified down to about 200 m with the measurements carried out. The in-situ temperature, higher than in laboratory conditions, appears to significantly increase the conductivity associated to smectite. In general, time-domain complex resistivity measurements are recommended as a complementary method to electromagnetic soundings for geothermal exploration. Léa Lévy is born in Paris (France) in 1990. Léa finished her high-school diploma in 2008 in Vanves (France) and her MSc in Civil Engineering at MINES ParisTech (France) in July 2014. Léa arrived in Iceland in January 2015, when she did a 4-month internship in experimental geochemistry at University of Iceland. After this internship, she was hired for another four months at ISOR (Iceland GeoSurvey) to develop a method for Cation Exchange Capacity measurements of hydrothermally altered volcanic rocks. 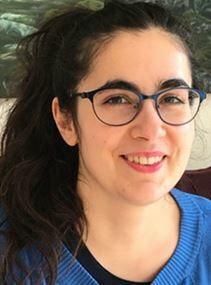 She used her time in Iceland to write her PhD project, in collaboration with University of Iceland and ISOR, as well as two French universities: Ecole Normale Supérieure (Paris) and University of Montpellier. She obtained a 3-year PhD grant by Paris Sciences et Lettres for this project and started her PhD in December 2015, as a joint degree between Unviersity of Iceland and Ecole Normale Supérieure. Since then, she has shared her time between Reykjavik, Paris, Akureyri and Montpellier.